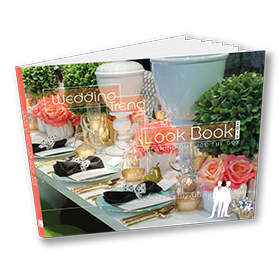 Chalayne and Dirk’s spring wedding was created with the celebrity style in mind, everything from the couples’ fashion selection to the thoughtfully crafted entrée choices embodied the A-list personality. When planning a wedding, first things first… find the dress! 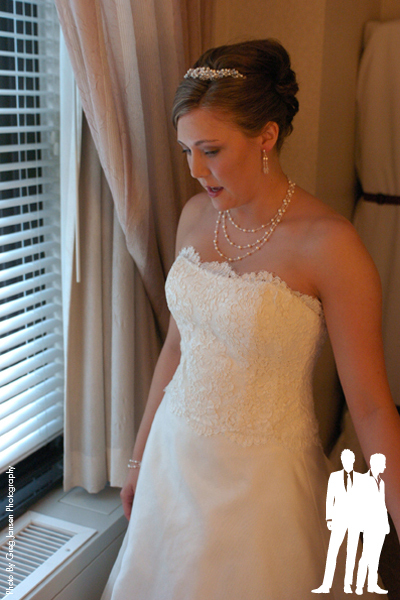 That’s just what Chalayne did, she selected her gown from Amy Jane Bridal in the Cathedral Hill area of St. Paul. 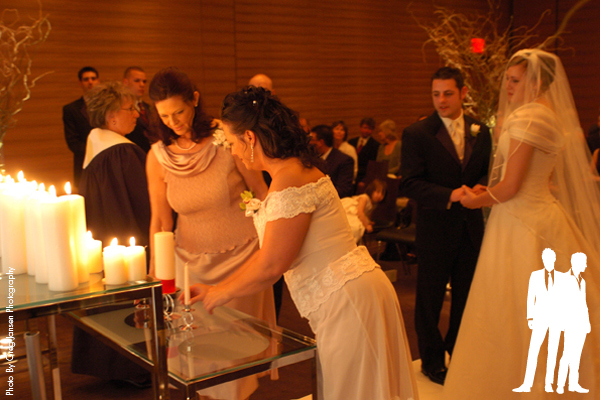 She had the help of her mother, Judy; sister, Chantel; and niece, Leah. 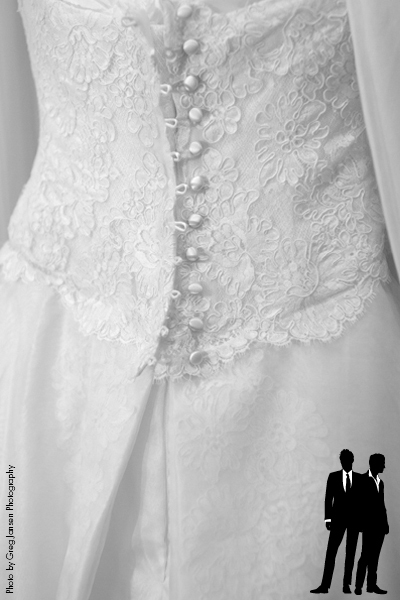 The entourage had a private appointment at Amy Jane Bridal with a selection of stunning Birnbaum & Bullock gowns. After trying on several and adding accessories, the big decision was made and the dress was on order. 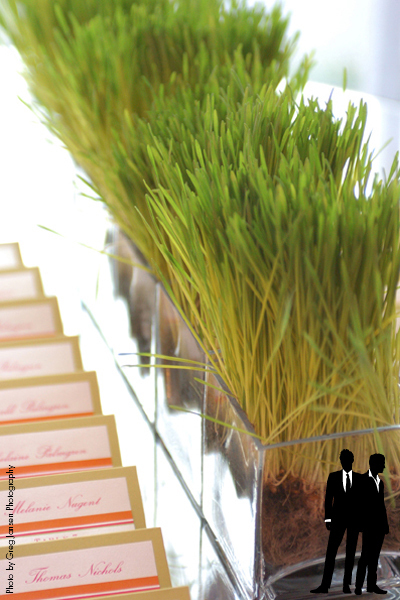 Crazy Daisy Design was in charge of creating the perfect celebrity worthy invitations. The design concept played off of the décor for the reception, with bright colors of chartreuse, fuchsia and orange, with a multi layered effect. 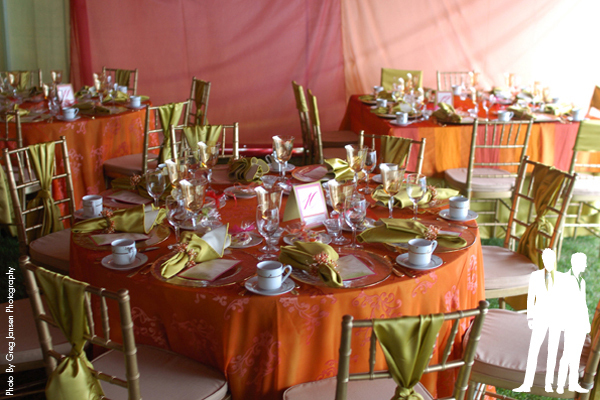 The stripe motif from one of the linens was used as an accent as was a squiggle design that complemented the design. Sara Doherty’s concept was a fold out invitation with stepped enclosure cards detailing ‘The Journey’, ‘The Ceremony’, the ‘RSVP’ and ‘The Celebration’. All were tied with a fuchsia dupioni silk ribbon that would match the sash of the bridesmaid’s dresses, and slipped into a pearlescent envelope with orange lining. With the invitations in the mail, next it was a trip to Arthur’s Jewelers to meet with Tyler Nogai to select the custom wedding bands. 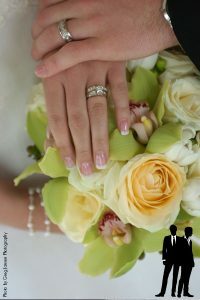 Chalayne and Dirk selected contemporary styled custom wedding bands crafted of 14K white gold and set with princess cut diamonds. 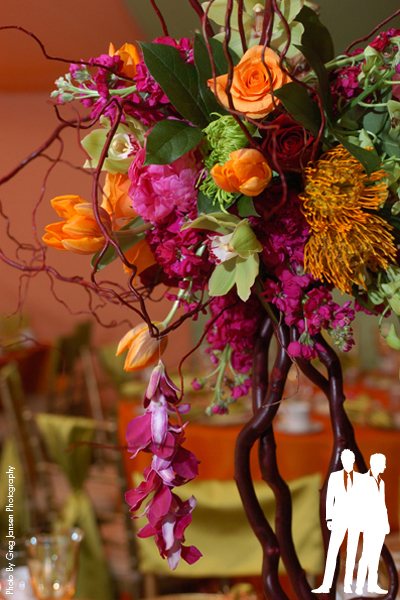 On April 15th, the pre-wedding festivities began with the bridesmaid’s luncheon at the fashionable 20.21 restaurant by Wolfgang Puck. 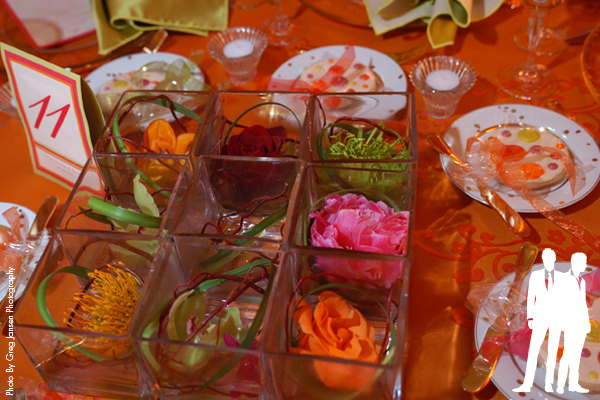 The luncheon featured seven courses, designed by the executive chef and served French style. Items included tuna tartar cones, lettuce wraps, cashew chicken salad and desserts to share. 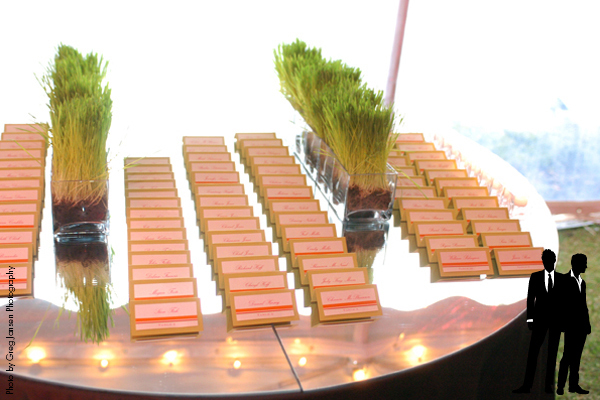 The bridesmaids were given gifts from Che Bella’s Boutique. The festivities continued late into the night with the bachelorette and bachelor parties. 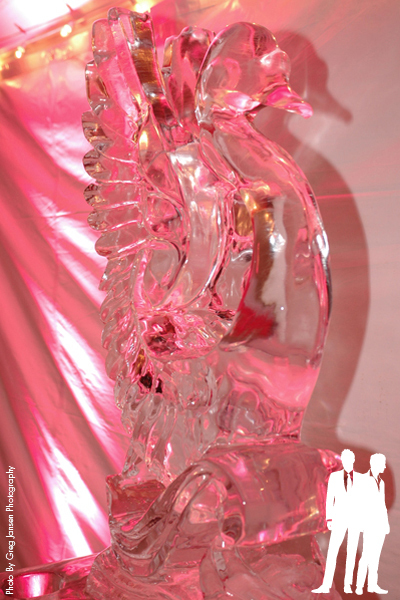 The women enjoyed an evening of limousine transportation from Star Limousine. 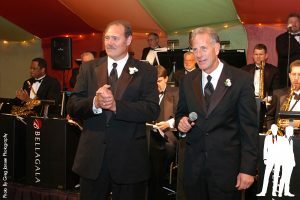 The evening started at Jitter’s Café and Martini Bar featuring live vocal performances and concluded in Stillwater.The men’s party started at 11:00AM and included an afternoon at All Seasons Golf Links and an evening at Cedar Lake Speedway. The arrangements continued to develop and the image of today’s love, romance, and family tradition would evolve throughout the rehearsal dinner and ceremony design with a very ethereal imagery of tone on tone white, light blue, lights and candles. 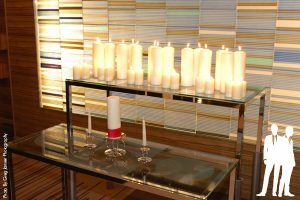 Midland Hills Country Club in Roseville was the scene for a beautiful white tone-on-tone rehearsal dinner infused with 126 lit pillar candles arranged on an “I” shaped dining table. 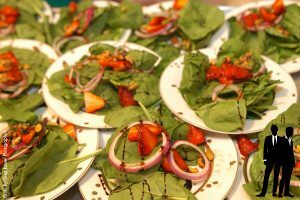 The culinary staff prepared a sumptuous dinner of gourmet herb breads, a salad of assorted baby lettuces and Florida oranges with maple chipotle vinaigrette and toasted almonds. Preempted by a citrus sorbet, the entrée selected was a filet mignon topped with béarnaise sauce, sautéed shrimp in lemon pepper cream sauce, served with garlic-mashed potatoes and Amaretto glazed greentopped baby carrots. Much to the delight of the guests the two chefs prepared tableside, Banana’s Foster and Cherries Jubilee Flambé. 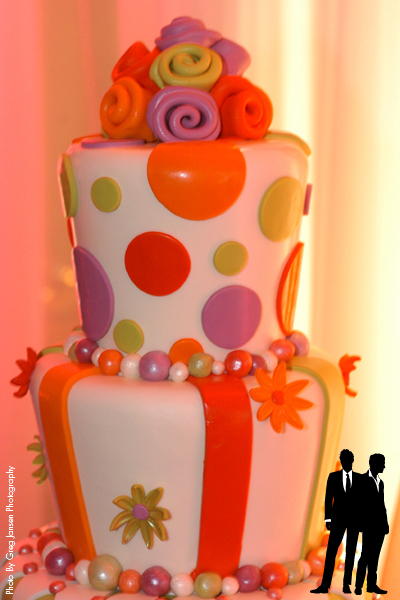 The cherished moment came as Chalayne presented Dirk, an avid golfer, with a custom designed Groom’s Cake – a gopher coming out of the golfing green with a golf ball atop his head created by Elegant Confections. Finally the wedding day had arrived! Megan Cerny of MG Hair and Makeup arrived at 9:00AM the morning of the wedding at the Grand Hotel to begin the hair and makeup session. With champagne mimosas, the celebration began as the bridesmaids toasted the bride and began their four hours of hair and makeup styling. Chalayne’s makeup consisted of a pink berry tone lip cover with shimmer cream blushes in pinks and peaches with a touch of bronze on the cheeks. Her hair was a French twist up-do with side-combed bangs. 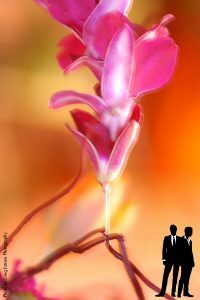 As Greg Jansen, the wedding photographer, zigged and zagged throughout everyone getting ready in the suite at the Grand Hotel, there was most definitely the thrill of excitement in the air with both the moms and bridesmaids having their photographs taken with Chalayne. The personal flowers for the bride and her maids were beautifully hand tied by Bayberry Flowers. 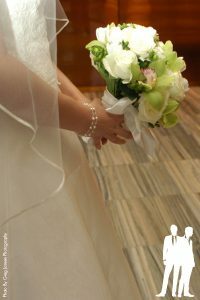 The bride received a very lush center-held bouquet with white roses, white tulips, green cymbidium orchids, and green hypericum berries tied in a white satin ribbon. 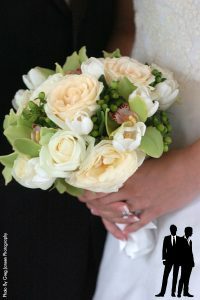 The bridesmaids received a bouquet of green cymbidium orchids and brazillea berries tied in black ribbon. 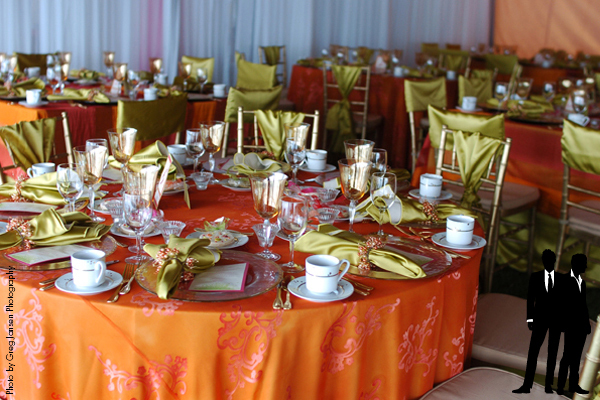 The ballroom at the Loews hosted the wedding ceremony and took on a very contemporary look. 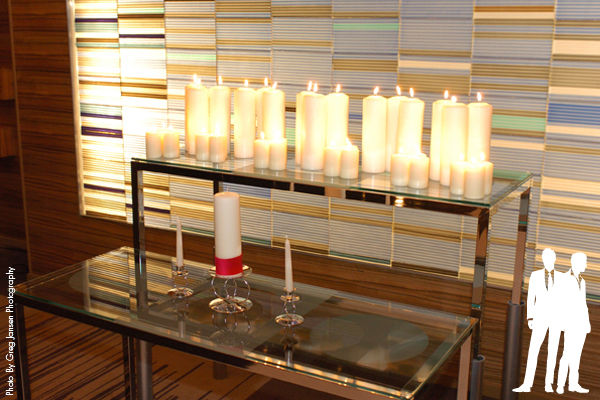 The vogue avant-garde vision of the ceremony was inspired by shimmering glass and fire. 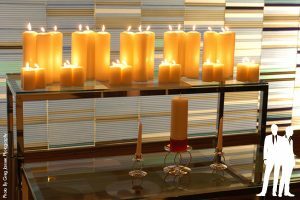 The ceremony featured a cool blue and white approach with lit candles and glass, completely enhanced with décor and flowers by Bayberry Flowers creating a mystical and luminous imagery to the occasion. To complement the lit cool blue glass wall and rich wood walls, the altar area was completed with a glass and chrome custom designed altar with large pillar candles while the aisle was outlined with bottom lit glass cubes illuminating the glass column vases filled with curly willow branches. 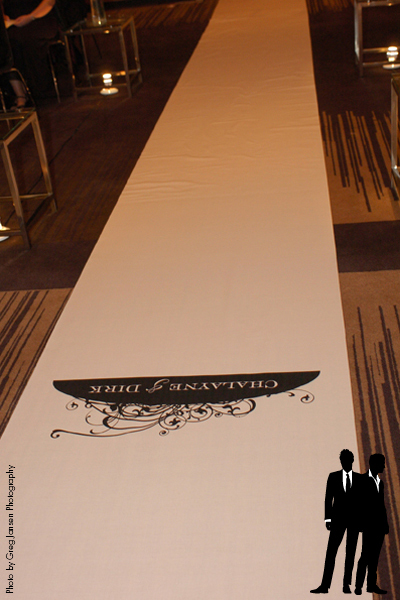 A custom aisle runner stretched from the altar past the curly willow sculptures to the back of the ballroom. The aisle runner in the color ‘whisper’ was from The Original Runner Co. in New York City and featured the swirl design on the invitation combined with Chalayne and Dirk’s names. 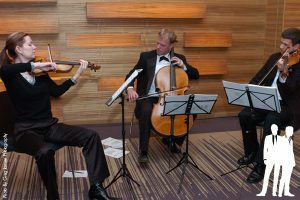 Making their entrance to Trumpet Tune in D by Purcell, performed by a string trio from Pro Art Music, the bridesmaids ascended the aisle and met the groomsmen who were waiting at the altar. 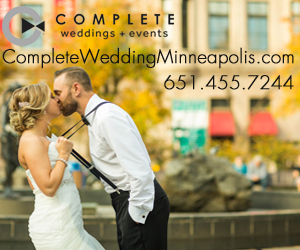 They were dressed in Davinci strapless black tea length satin dresses and a fuchsia tied sash from The Wedding Shoppe in St. Paul. 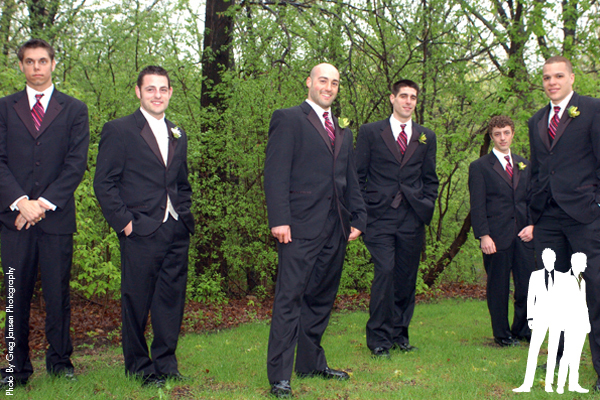 Dirk and the groomsmen were outfitted in tuxedos by Savvi Formalwear. 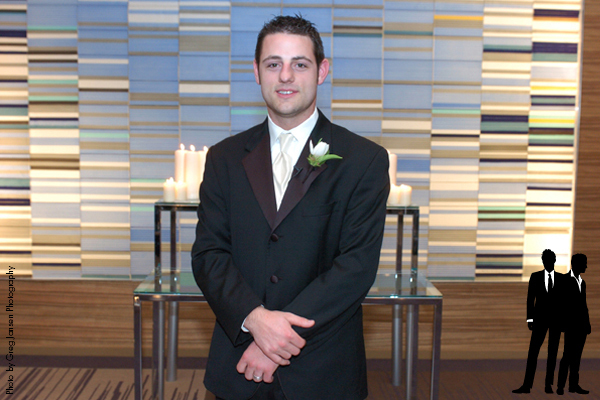 The groom wore a Black Milan by Lubiam 1911, a three-button, notched lapel tuxedo crafted of luxurious Loro Piana imported Italian wool. 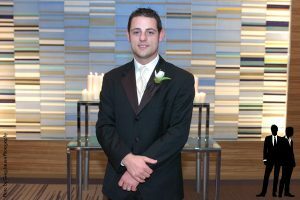 To complement the bride’s gown, Dirk selected an ivory microfiber laydown collar shirt and Ivory Solid Fusion vest and Windsorband tie. The groom’s boutonniere from Bayberry Flowers featured miniature tulips in white to complement Chalayne’s bouquet. All of the men in the wedding party wore the Black Constellation shoes, a fashion-forward slip-on with double runners leading to the toe. 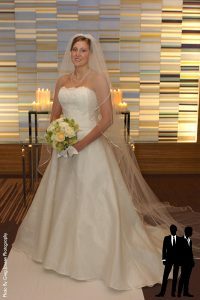 As if they were magical, the doors closed and reopened with the bride and her father appearing in their entire splendor. 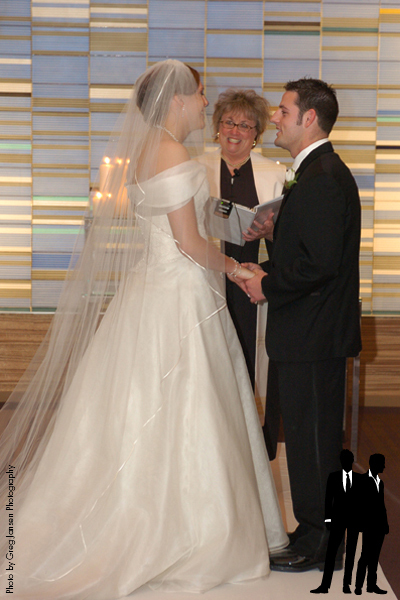 The Birnbaum & Bullock gown was beautifully constructed using silk shantung for the entire silhouette and Alencon lace for the bodice with a detachable silk organza stole and silk organza overlay on the skirt. For the brides comfort, the gown was lined in silk charmeuse. 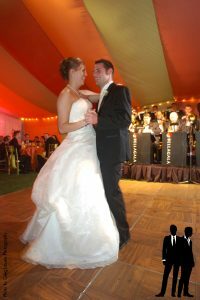 It was finished with hand made silk buttons and loops with a crinoline in silk tulle. 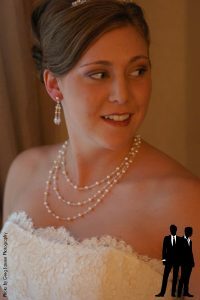 Her gown was accented with custom designed jewelry from the award winning design team at Che Bella. Her necklace featured freshwater pearls and crystals hand strung in three strands. 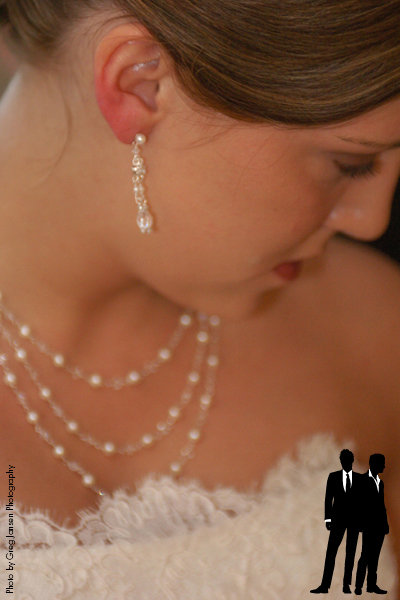 Delicate drop earrings also featured pearls and crystals. The finishing touch was a hand-wired freshwater pearl tiara with a cathedral length veil in silk tulle. 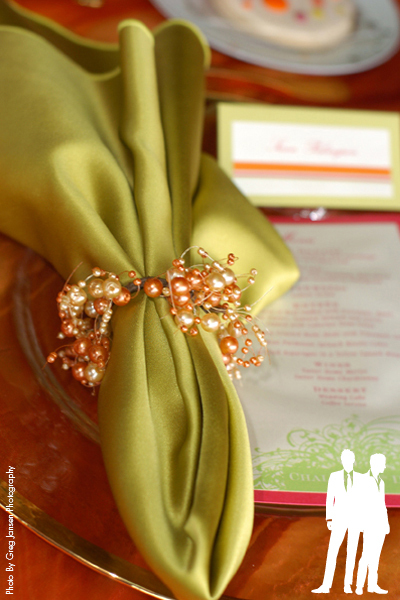 The custom ceremony program from Crazy Daisy Design featured an ivory pearlescent paper tied in fuchsia dupioni silk ribbon. 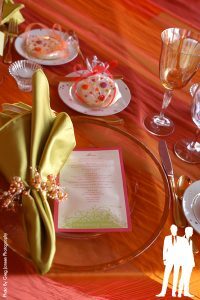 The type was in matching fuchsia and featured the same squiggle design as the invitation and aisle runner in chartreuse. Dirk and Chalayne selected traditional marriage vows. Jennifer Larson, Chalayne’s cousin, read I Corinthians 13 and Air for Suite 3 by Bach was performed for the lighting of the unity candle. The Couple exited to La Rejouissance by Handel. 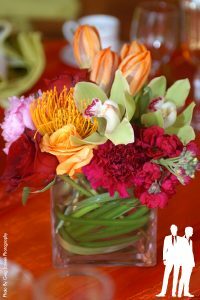 In complete contrast to the sleek contemporary atmosphere of the rehearsal dinner and the marriage ceremony, the reception would transform literally in front of the guests eyes. 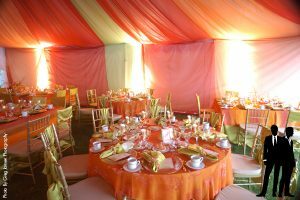 The design concept of ‘The Celebrity Style Wedding’ reception reflected a fresh and contemporary look utilizing specialty linens and décor in trend forward colors of chartreuse, orange, red, black and fuchsia provided by Après Party and Tent Rental. Hues of these colors washed the tent’s interior with the aid of 30 spotlights creating a stunning atmosphere in the dining room embellished by the floral masterpieces from Stems and Vines. 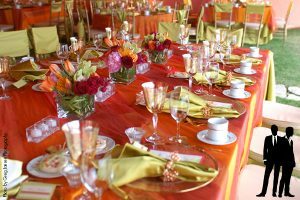 The tables were set with white and gold confetti china and alternating chargers; one set was glass with a hand-painted gold edge the other set was an ornate gold Italian Countryside charger. 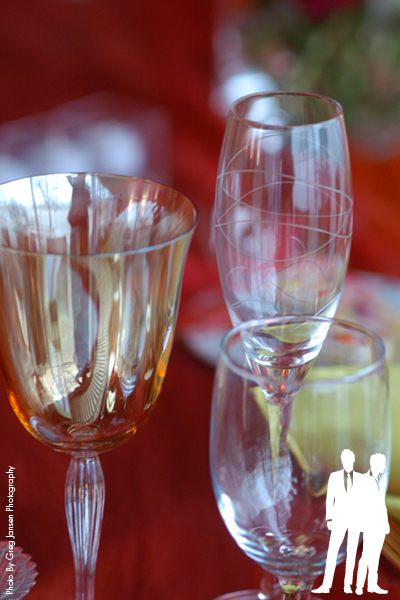 Gold Luxor flatware accented the Lido amber water goblets. 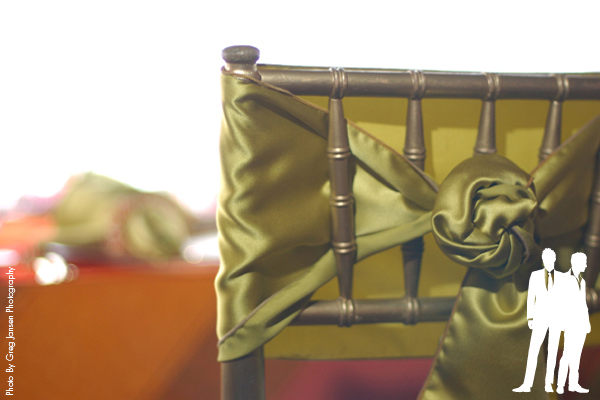 Chartreuse green napkins wrapped in pearl strung napkin rings were placed on the chargers next to the custom menu. 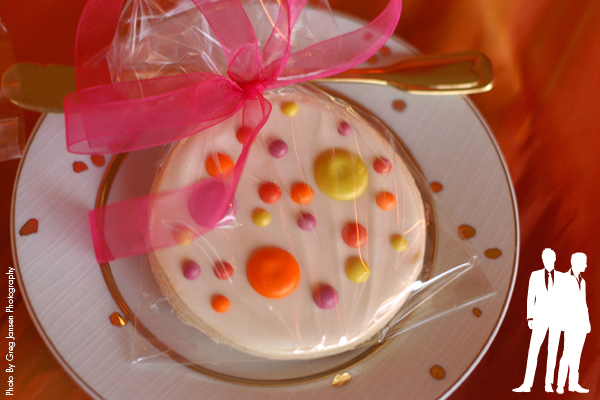 Elegant Confections created shortbread cookies with multicolored dots that coordinated with the wedding cake. 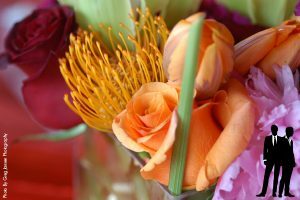 These were tied in clear cellophane bags with organza ribbons in bright colors. 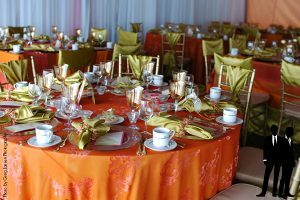 The tables were covered with two coordinating linens; Autumn Sheer Stripe which overlaid a chartreuse satin linen and a Saffron Burnout linen that featured a beautiful swirl pattern. 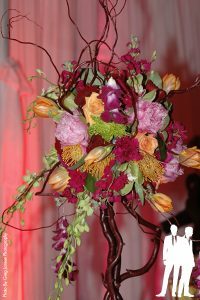 The centerpieces from Stems and Vines featured red curly willow branches topped with dendrobium orchids, pink peonies, orange tulips and roses, pink stock, green cymbidium orchids and orange pincushion protea. Guests arrived at a private lake estate to see the reception tent measuring 4,000 square feet overlooking St. Albans Bay on Lake Minnetonka. The entrance of the reception tent lead guests to the cocktail lounge which was draped in black, fuchsia and white. Guests socialized in a cocktail lounge separate from the dining room with a circular bar in the center of the room. 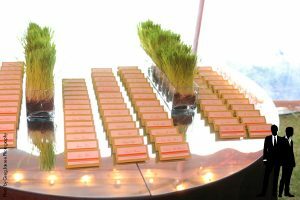 Cocktail tables in pink featured tall square centerpieces topped with bear grass and included orchids strung on silver wire in clear glass vases. The lounge showcased a number of elements including a photo booth by Photobooth Memories where guests could have fun having their photos taken in a vintage photo booth. 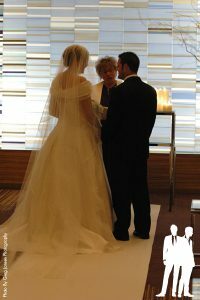 A custom leather photo album was provided for the guests to include photos and personal messages for the bride and groom. 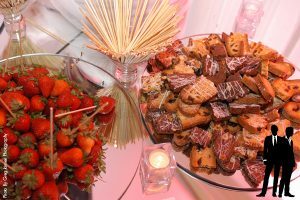 Guests enjoyed the opportunity to dip strawberries and shortbread cookies into the chocolate fountain provided by Chocolate Cascade Heaven. Tom Doyle carved a custom swan ice sculpture that chilled magnums of champagne for the bar service provided by Complete Beverage Service. 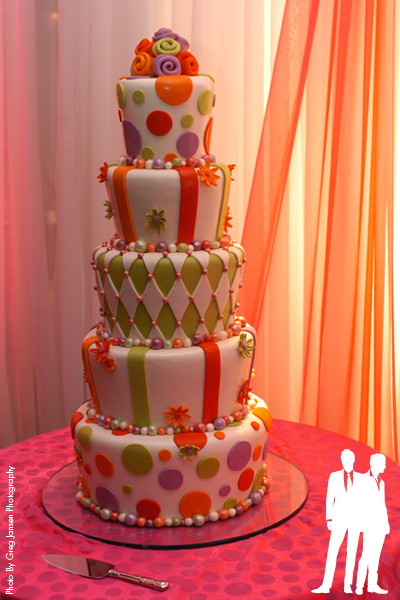 The crowning masterpiece was a multi-flavored, five-tier, four-foot tall wedding cake in a dazzling Mad Hatter design by Elegant Confections. 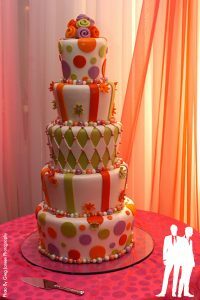 The cake was covered in buttercream icing and vibrantly colored fondant with a harlequin pattern, dots, stripes and accented with retro daisies! Inside were five different flavors: Traditional Bridal white cake with classic raspberry filling and vanilla buttercream icing; golden butter cake with strawberry buttercream filling and vanilla buttercream icing; Banana cake with cream cheese buttercream filling and vanilla buttercream icing; layered Irish tuxedo torte with golden butter and dark chocolate cake filled with Irish buttercream; and last but not least; dark chocolate cake with vanilla buttercream filling. 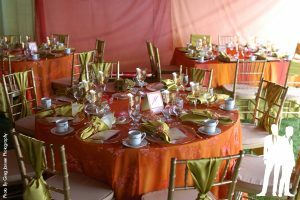 As dinner was about to be served the up-lighting changed from fuchsia to deep red and the drapery was pulled back revealing the stunning dining room in full vivid trend colors of orange, red, fuchsia and chartreuse. As the DJ from Bellagala played sweeping entrance music, guests strolled through to find their seat for dinner. 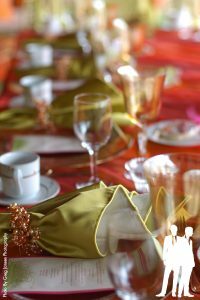 The guests dined on gourmet cuisine prepared on site by the chefs at Prom Catering. Fresh baked breads included sesame, black jalapeno and sourdough and were set off by butter rosettes on lemon leaf. A decadent spinach salad featured strawberries, pistatcios, red onions along with a balsamic reduction and stawberry vinaigrette. Lemon sorbet was served in martini glasses with a delicate garnish of lemon and mint. A sumptuous duet entree of tenderloin of beef stuffed with provolone, basil, red pepper, sautéed spinach and garlic was topped with Cabernet demi-glaze. Accompanying this delicious filet was Macadamia crusted Mahi Mahi with pineapple salsa, mini parmesan spinach risotto cakes, and grilled asparagus in a yellow squash ring was served in splendid white glove butler service. The wine selection for the evening’s menu included a choice of Merlot or Chardonnay which paired perfectly with the entrees. 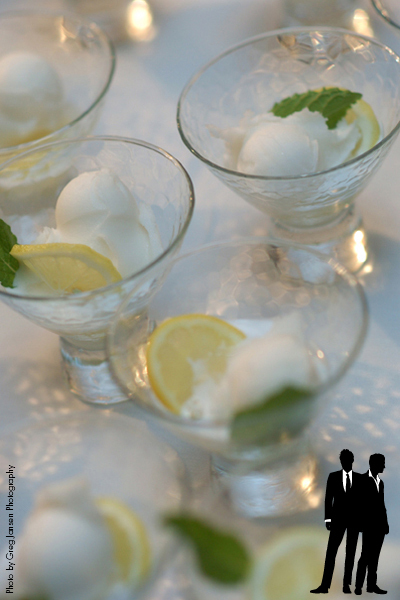 After dinner, toasts were made by the fathers, best man and matron of honor. Guests danced the night away to the sounds of the Bellagala Big Band who performed favorites like ‘Unforgettable’ and ‘New York, New York’! 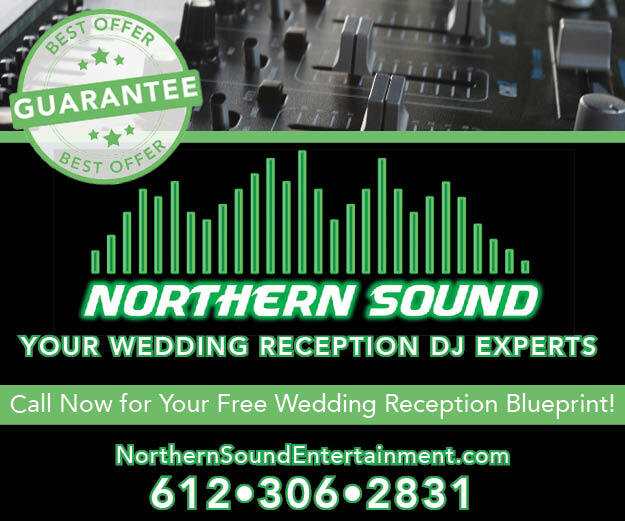 During the breaks Bellagala provided a Disc Jockey to play today’s contemporary hits. 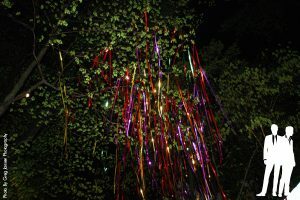 The guests were treated to a resounding send off to the couple by an amazing blast of confetti and streamers by RES Specialty Pyrotechnics at the end of the evening and the bridal party departed for a private after-party celebrating well into the night!